Hello. My name is Michelle Yeo and I am an Australian quilt designer and teacher with a love of reproduction fabrics & antique quilts. My friend Virginia and I were lucky enough to visit Margo in November and spend 2 lovely nights looking through her fabric sample books. We enjoyed 2 days 'playing' in her shop, 'Reproduction Fabrics', where we were easily entertained sifting through a drawer of Dargate fabric scraps from bygone treasures and drooling over the wonderful shelves of reproduction fabrics all arranged according to era. Margo topped off my stay in the US by asking me to design and make a quilt using her new, upcoming fabric range, 'Dargate Treasury' by Andover. Of course I couldn't say no to that request! 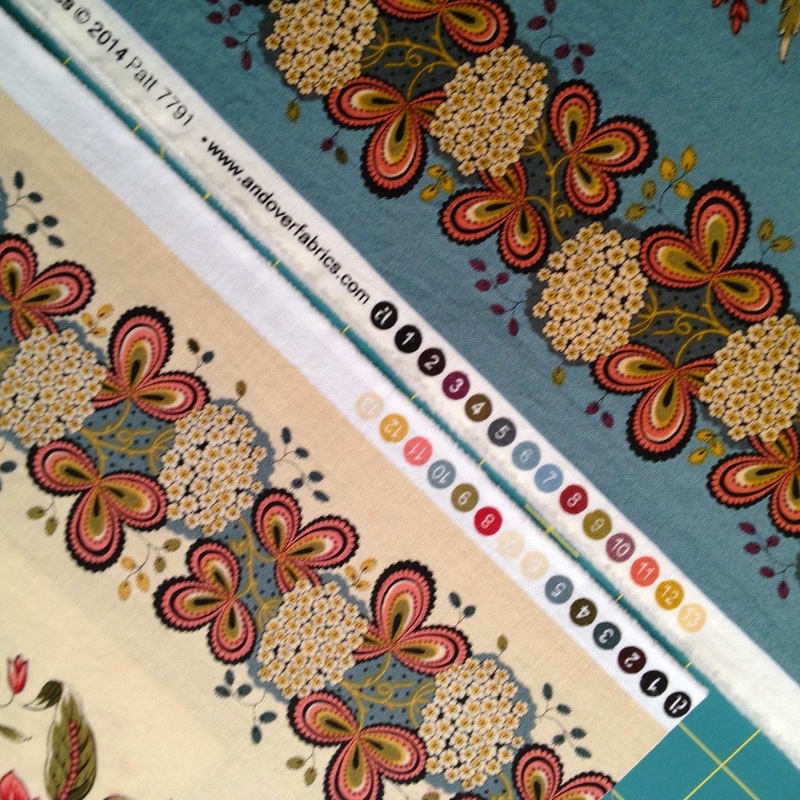 I left Margo, and America, complete with the Skus card for the Dargate Treasury fabric range and I have spent much time since pondering over a design that would do these beautiful fabrics justice. Enjoy and I hope you like it! Is Desultory a Quilter's Term? A porch railing I saw at a Chinese museum inspires my upcoming quilt pattern named Peace and Prosperity using the Dargate Treasury fabrics. I think you will be pleased with the simple piecing. A one-inch sashing creates the porch railing and the Dargate Treasury floral stripe fills the negative space. Two blocks, measuring 7 x 23 inches each, alternate to produce the pattern in the porch railing. 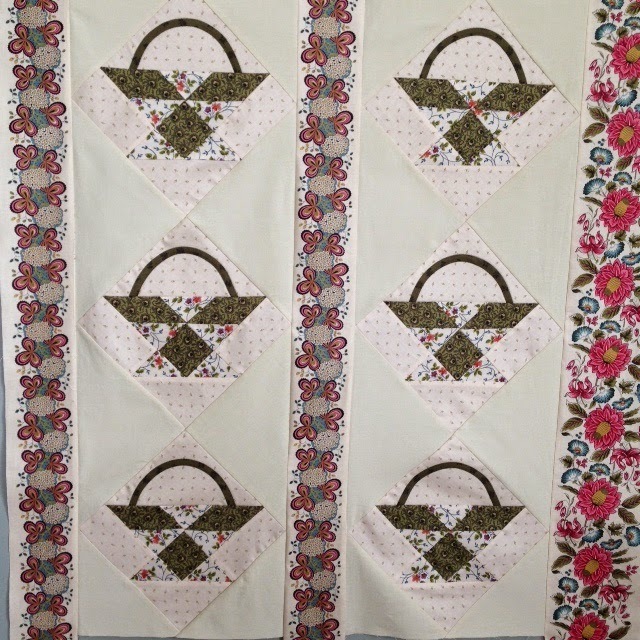 In the Dargate Treasury collection, there are four lovely color ways of the floral stripe fabric. I am obsessed with wanting to use at least two of them in one project. I chose the cream colored floral stripe and the aqua colored floral stripe with the red fabric that coordinates with both colors as the sashing. It should work. Look at the perfect companionship of the color dots. I asked my non-quilter husband for his opinion which he gave without hesitation, "It's desultory." What?! That's not a quilter's term. Seconds later, I have the dictionary app open. Desultory: lacking in consistency, or visible order, disconnected. Okay, I get it. Sometimes you just need a non-quilter husband with an objective point of view and a vocabulary better than your own. There were two things not working right. First, the two alternating blocks, which create the pattern of the porch railing, need to end in an odd number of blocks across and down so that the left and right sides (and top and bottom) of the quilt match. Some blocks are like that. The 4-patch configuration had six blocks across and two blocks down. By ending in an even number of blocks and not matching on the sides or top and bottom, it was out of balance. We admire artistic asymmetry in today's modern quilts, but this was not that. This was just, plain off-balance. The other problem was that the red sashing gave pop to the cream floral stripe, but lacked the same enthusiasm with the aqua floral stripe, probably because of value issues. Another Dargate Treasury coordinating fabric that would be perfect with the aqua is the cream colored tiny swallow fabric. I love that one and I'm getting inspiration to create a paper-pieced or appliqué swallow. The solution--go back to the original inspiration from the unique porch railing and make a table runner with the cream colored floral and red sashing. If you are wondering about the fate of the aqua pieces that were already sewn together, they make a lovely pillow. 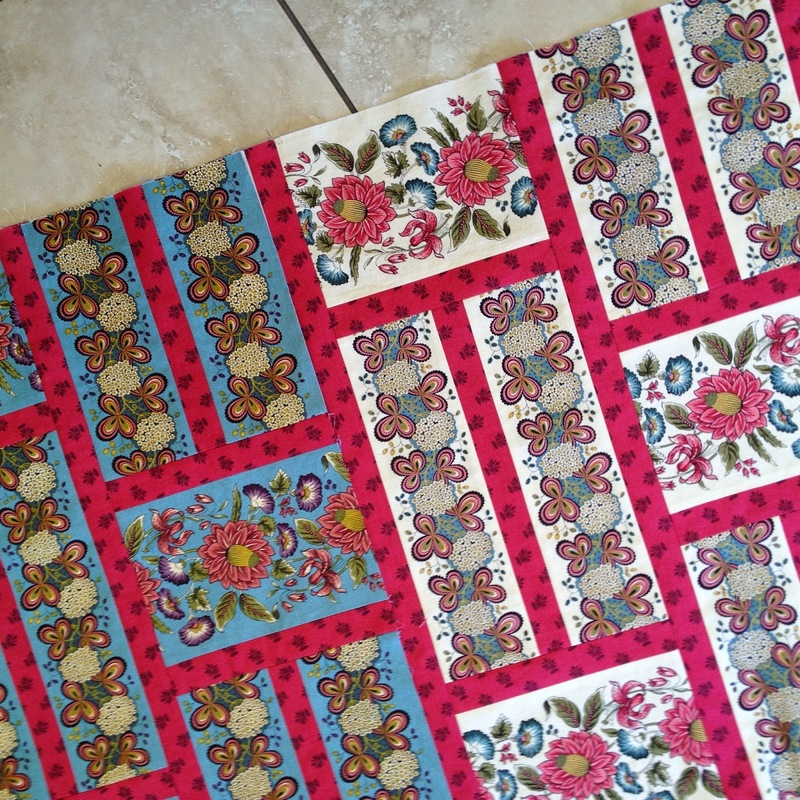 The pattern which will be coming out with the Dargate Treasury fabric in May will include instructions for adjustable length table runners, placemats, and pillows and guidelines for how to "grow your quilt" into various larger sizes that maintain balance and help you avoid a critique of "desultory." Parallelograms..got to love them! 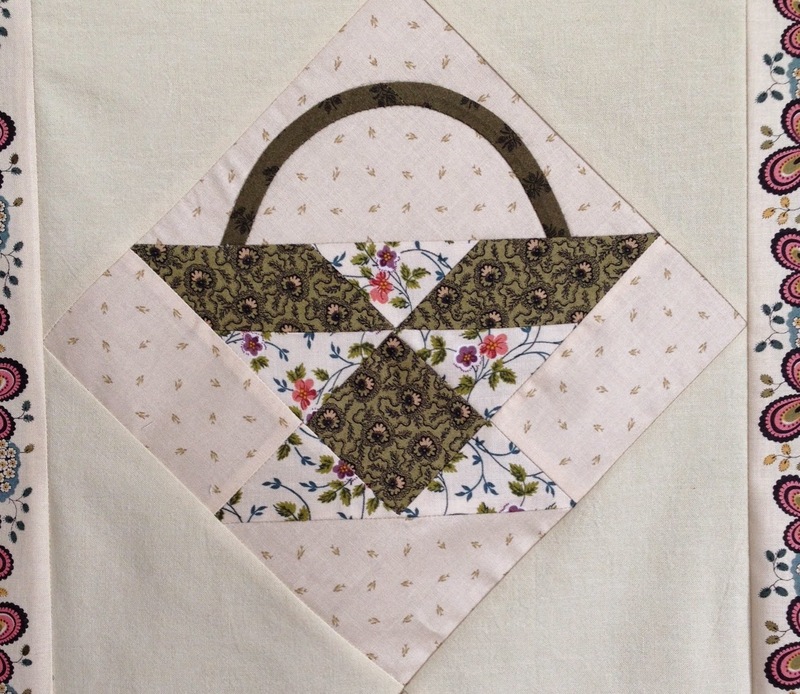 My friend Mary Robbins found the pattern in Barbara Brackman's book under 'Bread Basket'. I have up loaded the entire line of Dargate Treasury to my website. It is currently on wish list. We will cut and ship April 27, 2015. I am very excited about this new Dargate line....the first since 2007!